I'll be back soon! I'm tent camping in Badlands National Park and a bit busy! My view while enjoying my morning coffee.... Badlands National Park. Were you there recently? We probably saw each other! Back to Just the Coffee Talking soon! This morning's 'chit chat over morning coffee' came to mind from a daily "what happened on this day in history" email I get. (Source). 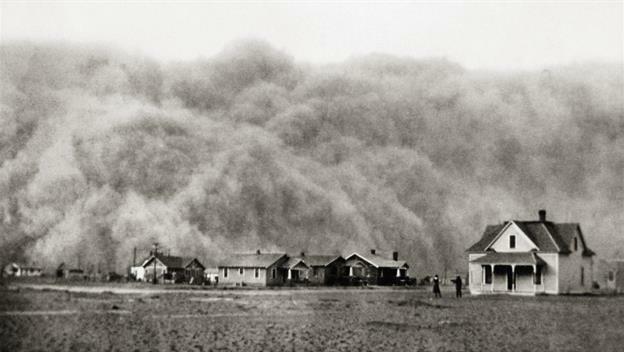 On this day in 1934, a massive dust storm sent millions of tons of topsoil across the Great Plains region of the United States as far east as New York, Boston and Atlanta. 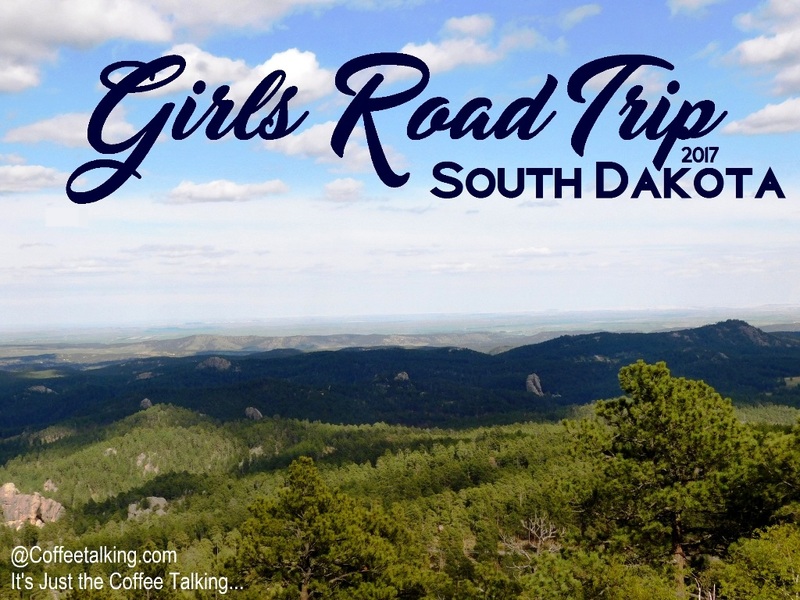 First, the history of this massive dust storm and then, coffee talk. ".... At the time the Great Plains were settled in the mid-1800s, the land was covered by prairie grass, which held moisture in the earth and kept most of the soil from blowing away even during dry spells. By the early 20th century, however, farmers had plowed under much of the grass to create fields. The U.S. entry into World War I in 1917 caused a great need for wheat, and farms began to push their fields to the limit, plowing under more and more grassland with the newly invented tractor. The plowing continued after the war, when the introduction of even more powerful gasoline tractors sped up the process. During the 1920s, wheat production increased by 300 percent, causing a glut in the market by 1931. Another massive storm on April 15, 1935–known as “Black Sunday”–brought even more attention to the desperate situation in the Great Plains region, which reporter Robert Geiger called the “Dust Bowl.” That year, as part of its New Deal program, President Franklin D. Roosevelt’s administration began to enforce federal regulation of farming methods, including crop rotation, grass-seeding and new plowing methods. This worked to a point, reducing dust storms by up to 65 percent, but only the end of the drought in the fall of 1939 would truly bring relief." upside down to keep out dust. Although this storm was massive enough to make the news and make history, those who lived in the heartland of America at the time dealt with many, many dust storms during this time and a few after. I grew up hearing about these from my grandmother and later, my Dad. My father was born in 1948 and lived on a farm where his parents tried to scratch out a living in the land. He remembers a couple dust storms and his descriptions and stories used to fascinate me as a kid. The heartland of America is black dirt and where they farmed it was especially rich, black soil. However, a lot of this dust was traveling across the plains from other states. My Dad remembers when he was very small, a massive storm blew across the heartland. Of course to save your animals and yourself, you had to be inside, protected or you could not breathe nor see. He recalls waking up the next morning with a thick layer of red dust covering everything in the house. A thick layer covered everything outside as if it had snowed red dust instead of cold, white flakes. After these storms, all her adult life, my grandmother stored the drinking glasses in the cupboards upside down to keep out dust. It's how my father and his siblings were raised and when he married and had a family he and my Mom stored the drinking glasses upside down. To this day, if you get a glass out of our kitchen cupboards, or even a cup for your coffee, you will find our drinking glasses and mugs are stored... upside down. Even though I'm an Amazon affiliate and I order from Amazon fairly often, I am not a Prime member. I've blogged about that in the past (if you are a regular reader of Just the Coffee Talking you might recall me mentioning this previously). I absolutely will not pay $99 to become a Prime member just to get 2 day free shipping. Amazon does offer other things besides free 2 day shipping with Prime Memberships but honestly I don't/won't use any of those 'extra' benefits so for me it's not a good fit. I do not get 2 day shipping since I'm not a Prime member - but it's 'free' shipping for those with an order of select items with a minimum order amount. They say 5-8 days free ship, but it's typically 10 day average. And I have canceled two items in the past two months because on the 10th day they still had not shipped it and it was "preparing for shipping" but it was arriving too late for me to use. Another 10 day shipping date upset me as it was an uplifting 'get well soon' gift for my brother who was having major surgery. However, usually I don't mind waiting 8-10 days for my order to arrive because I'm not in a particular hurry. If I was demanding 2 -day free shipping I suppose I'd cave and buy the $99 annual membership to Prime. (If you are interested in Prime here is a tiny bit more information: It offers fast, FREE shipping on over 50 million eligible items - and if you live in a select metro area you can even get free 2 hour shipping - crazy. So, with Prime you choose from two-hour, same-day or 2 day delivery. Yes, all free.) Those 'extra' benefits I mentioned above are not important to me or my lifestyle but if you are interested in free steaming of movies and music, are a gamer, want unlimited e-books to read, etc. then it might be a good deal for you. With FREE Two-Day Shipping and more from Amazon Prime, your shopping problems are solved. You get unlimited deliveries with no minimum order size. When shipping to select metro areas, Prime members also get FREE Same-Day Delivery on over a million items and FREE 2-hour delivery with Prime Now on daily essentials and groceries. With FREE release-date delivery on eligible pre-order items, you can enjoy highly anticipated books, movies, and video games as soon as possible. Your Prime membership includes instant access to thousands of movies and TV shows at no additional cost; On-demand, ad-free music streaming - featuring a growing selection of two million songs, unlimited reading on any device -with unlimited access to over a thousand books, current issue magazines, books. Unlimited listening to original audio series and Twitch Prime gets you free game content every month, exclusive discounts, plus loads more. Your Prime membership comes with free unlimited photo storage through Prime Photos, which lets you securely save as many photos as you like and see them on your phone, computer, or tablet. You can share this Prime benefit and give free photo storage to up to five family members or friends. But I'm starting to ramble over coffee again... the point of this post is to say that the competition Walmart is giving Amazon with their 2 day free shipping without a membership must be working because I read this morning in the news that Amazon is lowering their price to qualify for free shipping. They just lowered the free-shipping minimum to $25 from $35 for customers who aren't members of its Prime membership program. This is the second time in three months that Amazon has lowered its free shipping threshold. Because I use the minimum order threshold for my own personal orders I had watched it go UP from $25 to $35 and then up to $49 (which did actually effect the number of orders I was placing) and now, since February this year I've watched the competition cause them to fall back to a minimum of $35 (matching Walmart's $35 minimum) and now - it looks like they have quietly dropped it again to $25! YIPPEE! The latest drop in minimum order cost comes after Walmart's launch of a new discount for customers who ship purchases to one of the retailer's stores, instead of to a home or elsewhere. Since this little competition between Walmart and Amazon I have been ordering from Walmart more often. They have a lousy search engine, numerous listings for the same items with different price points and terrible product descriptions but if you know what you want and have researched it elsewhere, you can get some great prices and free 2 day shipping. And now I'm going to stop typing - go brew ONE MORE cup of coffee and finalize my plans and packing list for a long camping and hiking trip I'm preparing for... which is what I was supposed to be doing when I decided to type out this blog post instead. I was reading an article online and glanced down to a cool photo that at the bottom of the page. It was one of those 'out-sourced' links they put to get you to click on another story. 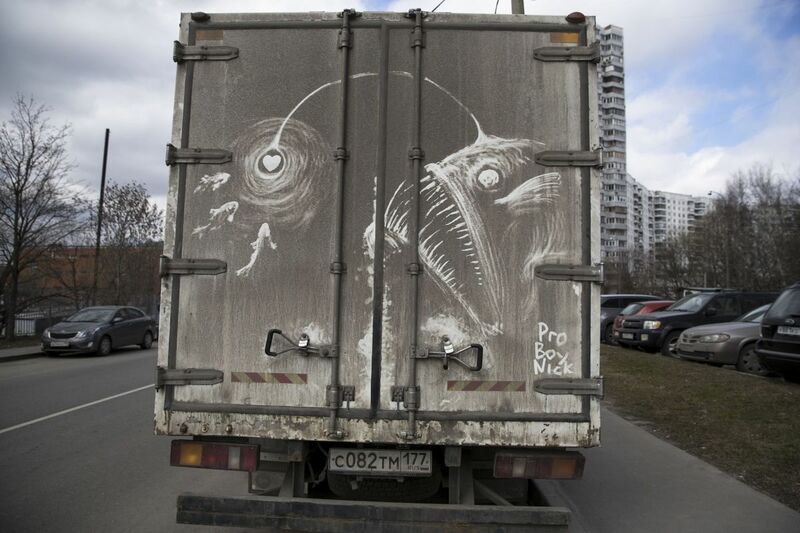 Usually I don't click on them but the photo was of an angler fish drawn into the dirt on the back of a truck. It was pretty cool so I clicked. 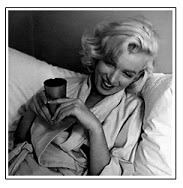 Here is just a snippet - because I thought it was a cool coffee-conversation piece on Coffee Talking this morning! "When Nikita Golubev sees a dirty white truck or van he uses it as a canvas for his drawings. With his gloved hand, he draws giant pigeons on the back of a delivery truck. A face with reptilian eyes appears on the back of a white van covered in enough dirt to make the license plate all but illegible. 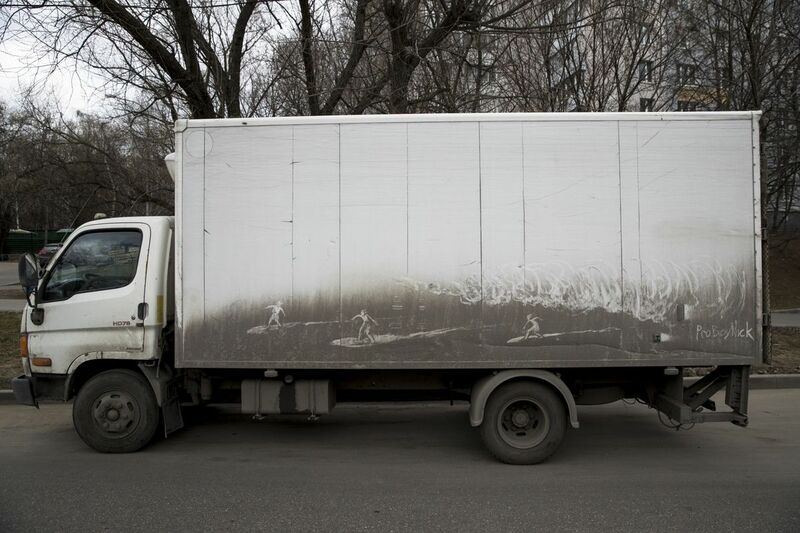 Surfers skim along the side of a truck. But none of it lasts. "Everything is washed away with the first rain," Golubev says. "It goes away and nothing remains." His creations are preserved only in the photographs he takes and posts on Instagram, where they have acquired a following. He signs his drawings Pro Boy Nick." Read the whole article on Fox News.